Sorry Gallup, this link goes to the Daily Kos. Mostly because it’s value-added if you hit the comments after checking out the extra content. And of course, If you’re finding this page later than today’s date hit this link for my latest update, or better yet head straight to 538 for their very latest projections. Not the greatest audio on this clip, but great camera work. I saw these guys last night — not this show — and they totally brought it. And it wasn’t even the full varsity lineup. Totally brought it. Happy Halloween all — be safe, stay spooky. That’s right, it’s Halloween so I’m doubling down. The audio on this is much better, so either turn it down or just brace yourself. CAPE CANAVERAL, Fla., Oct. 30 /PRNewswire-USNewswire/ — NASA managers completed a review Thursday of space shuttle Endeavour’s readiness for flight and selected the official launch date for the STS-126 mission. Commander Chris Ferguson and his six crewmates are scheduled to lift off to the International Space Station at 7:55 p.m. EST on Nov. 14. Endeavour’s STS-126 flight will feature important repair work to the station and prepare it for housing six crew members during long-duration missions. The primary focus of the 15-day flight and its four planned spacewalks is to service the station’s two Solar Alpha Rotary Joints, which allow its solar arrays to track the sun. Endeavour will carry about 32,000 pounds to orbit, including supplies and equipment necessary to double the crew size from three to six members in spring 2009. The new station cargo includes additional sleeping quarters, a second toilet and a resistance exercise device. Endeavour’s launch date was announced after the conclusion of Thursday’s Flight Readiness Review. During the meeting, top NASA and contractor managers assessed the risks associated with the mission and determined the shuttle’s equipment, support systems and procedures are ready for flight. Ferguson will be joined on STS-126 by Pilot Eric Boe and Mission Specialists Donald Pettit, Steve Bowen, Heidemarie Stefanyshyn-Piper, Shane Kimbrough and Sandra Magnus. Magnus will replace space station crew member Greg Chamitoff, who has been aboard the station for more than five months. She will return to Earth during the next shuttle mission, STS-119, targeted to launch in February 2009. Update 11/14 — The shuttle is off. Godspeed. We do live in a world economy. Banks are closely tied together across borders and oceans, and even relatively potent economies are hurting because it’s pretty hard to export when there’s no buyers. The U.S. economy shrank in the third quarter as the financial crisis raged while Japan and Germany said on Thursday they would spend billions of dollars to provide a cushion against a deep global recession. The spending measures would complement a series of interest rates cuts, including those from China, Norway and the United States on Wednesday. Japan may cut rates on Friday and the European Central Bank, Britain and Australia are expected to follow next week, which would come just as data showed a rapid deterioration in major economies. “A harsh storm seen only once in 100 years is raging,” Japanese Prime Minister Taro Aso told a news conference. The world’s largest economy shrank at a 0.3 percent annual rate in the third quarter, the sharpest contraction in the United States in seven years. The specter of recession had unnerved U.S. consumers, who slashed spending at the sharpest rate in 28 years in the third quarter, undermining growth. And to provide a taste, here’s a video of “Orange Blossoms” and a second video of an interview with JJ Grey. Good stuff all around! What behaviour do website visitors exhibit? Do they buy a specific product mainly on Mondays? Do they always return at a certain time of day? Being able to recognise and make use of such patterns is lucrative business for companies. Edgar de Graaf discovered that interesting patterns often contain a time aspect. Jeroen De Knijf developed methods to detect relevant patterns quicker. In subject jargon it is called data mining: looking for interesting relationships within large quantities of data. Many data-mining programs produce a flood of potentially interesting patterns: as a user, how can you then find what you are looking for? Furthermore, the files are not always set up for such search actions, as is the case on the Internet or for instance in bioinformatics. It usually concerns semi-structured files: they often contain, for example, hyperlinks to other files, and contain (partial) information in a range of formats, such as text, images and sound. Edgar de Graaf and Jeroen De Knijf both worked within the NWO-funded MISTA project (Mining in Semi-Structured Data) on methods to find patterns more quickly and effectively within large quantities of semi-structured data. De Graaf discovered that some patterns are interesting because they occur in quick succession. Other patterns are striking because, for example, they occur weekly. According to De Graaf, this time aspect merits further investigation. The patterns can best be presented visually so that the user can find the information sought at a single glance. To realise this De Graaf described various ways of presenting different types of information. De Knijf demonstrated that the number of patterns can be drastically reduced by allowing the user to indicate in advance the minimum requirements that a pattern must satisfy. This allows the data-mining program to find the interesting patterns much faster. A second method De Knijf devised to reduce the number of results is the compression of the entire collection of documents (for example, Wikipedia pages) into a single document. By building accurate models that only make use of the compressed document, De Knijf was able to demonstrate that this summary does indeed contain the essential information from the entire collection. The research was funded from the Open Competition 2003 of NWO Physical Sciences. A very desperate move by a very desperate campaign that doesn’t have the money to defend states like Arizona and still hope to compete in battleground states. John McCain and the Republican National Committee are now running robocalls attacking Obama as weak on terrorism — in McCain’s home state of Arizona, according to multiple readers from the state. The call signals genuine worry about McCain’s home state at a time when several polls show the race to be much closer than expected there. Do political media endorsements matter? Maybe according to this Brown University study. Endorsement Effects: Are Voters Influenced by Newspaper Picks? More than 150 newspapers across the country have already endorsed Sen. JohnMcCain or Sen. Barack Obama for president, with more to come in the remaining days before the election. Do these endorsements really matter? In a new paper, economist Brian Knight investigates the effect of endorsements on voter decision making and finds that they are, in fact, influential. PROVIDENCE, R.I. [Brown University] — Newspaper endorsements for presidential candidates can influence voting decisions, according to new research by two Brown University economists. In a working paper, Brian Knight and graduate student Chun Fang Chiang demonstrate that voters are more likely to support the recommended candidate following the publication of an endorsement, but any degree of influence depends on the credibility of the paper’s pick. To estimate the influence of newspaper endorsements, the researchers used individual-level data on voting intentions and newspaper readership in the months leading up to the 2000 and 2004 elections. They measured endorsement credibility based on the ideological leanings of newspapers, ownership, and reader preferences. To provide a sense of the magnitude of endorsement effects, Knight and Chiang feature a data table that shows the estimated influence in the top 20 newspapers during the 2000 presidential campaign. They show the least credible endorsements were for Al Gore from The New York Times and for George W. Bush from the Dallas Morning News, which convinced less than 1 percent of their readers to switch allegiance to the endorsed candidate. By contrast, the endorsement with the largest effect came from the Chicago Sun Times, which was predicted to endorse Gore with a probability of 58 percent, but instead endorsed Bush. This endorsement convinced about 3 percent of readers to switch allegiance from Gore to Bush, according to the findings. These findings are particularly interesting considering the 2008 presidential endorsements. According to Editor and Publisher Magazine, more than 27 newspapers that backed George W. Bush in 2004 have endorsed Obama this year (as of Oct. 22), including large papers such as theDenver Post, Chicago Tribune and New York’s Daily News. “We expect these Obama endorsements to be particularly influential since they have more credibility than endorsements from newspapers that always support the Democrat,” said Knight, associate professor of economics and public policy. A full copy of the paper is available to download (PDF) from Knight’s research web site. … of the presidential race. I guess technically this analysis is for one week out since he put it out on Tuesday. 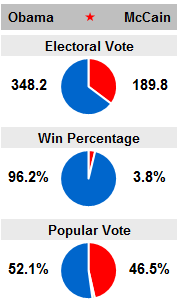 Since early September this race has shifted rather dramatically in Obama’s favor. As long as the focus is almost exclusively on the economy, this race is almost unwinnable for McCain. It would take a major external event, the proverbial October Surprise, to shift the spotlight to national security or some other subject that would allow McCain to highlight his strengths. At this stage, the most relevant question would seem to be: “How big will the train wreck be for the Republican Party up and down the ballot in November.” Obama currently has a 286 to 163 Electoral vote edge, with 89 Electoral votes in the Toss Up column. 270 are needed to win. Don’t know if anyone noticed, but I took yesterday off from blogging. My wife was off work and I decided I could use a break before the last few days of presidential horse race. My other break this week will be going to see these guys. Should be fun. A novel technique* under development at the National Institute of Standards and Technology (NIST) uses a relatively inexpensive optical microscope to quickly and cheaply analyze nanoscale dimensions with nanoscale measurement sensitivity. Termed “Through-focus Scanning Optical Microscope” (TSOM) imaging, the technique has potential applications in nanomanufacturing, semiconductor process control and biotechnology. Optical microscopes are not widely considered for checking nanoscale (below 100 nanometers) dimensions because of the limitation imposed by wavelength of light—you can’t get a precise image with a probe three times the object’s size. NIST researcher Ravikiran Attota gets around this, paradoxically, by considering lots of “bad” (out-of-focus) images. “This imaging uses a set of blurry, out-of-focus optical images for nanometer dimensional measurement sensitivity,” he says. Instead of repeatedly focusing on a sample to acquire one best image, the new technique captures a series of images with an optical microscope at different focal positions and stacks them one on top of the other to create the TSOM image. A computer program Attota developed analyzes the image. Using an optical microscope, several images of a 60 nanometer gold particle sample are taken at different focal positions and stacked together. This computer-created image shows the resultant TSOM image…. While Attota believes this simple technique can be used in a variety of applications, he has worked with two. The TSOM image can compare two nanoscale objects such as silicon lines on an integrated circuit. The software “subtracts” one image from the other. This enables sensitivity to dimensional differences at the nanoscale—line height, width or side-wall angle. Each type of difference generates a distinct signal. TSOM has also been theoretically evaluated in another quality control application. Medical researchers are studying the use of gold nanoparticles to deliver advanced pharmaceuticals to specific locations within the human body. Perfect size will be critical. To address this application, a TSOM image of a gold nanoparticle can be taken and compared to a library of simulated images to obtain “best-match” images with the intent of determining if each nanoparticle passes or fails. This new imaging technology requires a research-quality optical microscope, a camera and a microscope stage that can move at preset distances. “The setup is easily under $50,000, which is much less expensive than electron or probe microscopes currently used for measuring materials at the nanoscale,” Attota explains. “This method is another approach to extend the range of optical microscopy from microscale to nanoscale dimensional analysis.” So far, sensitivity to a 3 nm difference in line widths has been demonstrated in the laboratory. * R. Attota, T.A. Germer and R.M. Silver. Through-focus scanning-optical-microscope imaging method for nanoscale dimensional analysis, Optics Letters 33, 1990 (2008). … requires quite a bit of testicular fortitude. And a casino roll doesn’t hurt either. Wall Street had another astounding advance Tuesday, with the Dow Jones industrials soaring nearly 900 points in their second-largest point gain ever as late-day bargain hunters stormed into the market. The Dow and the Standard & Poor’s 500 index were each up nearly 11 percent. There didn’t appear to be any one catalyst for the surge that saw the Dow nearly double its gain in the last hour of trading. Many analysts said investors were grabbing up stocks in the belief that the market had fallen too far in recent sessions; the Dow had dropped 500 points in two days. Some said buying early in the day came from anticipation of an interest rate cut Wednesday by the Federal Reserve, and the market just followed its recent pattern of building on its gains or losses in the last minutes of the session. From KurzweilAI.net — Congrats to Ray for being honored as a “top visionary” in international technology and IT industries. Silicon.com announced today its selection of the top visionaries in the worldwide technology and IT industries whose ideas shake up the status quo. The top three visionaries named were Tim Berners-Lee, Jimmy Wales, and Ray Kurzweil. Other visionaries named were environmentalist Jonathon Porritt, reality TV guru Peter Bazalgette, free software advocate Richard Stallman, Better Place founder and CEO Shai Agassi, journalist and political activist Arianna Huffington, and cyber law professor Jonathan Zittrain. Silicon.com also announced the Top Techies, Top Entrepreneurs, Top Agenda Setters, Top Business Leaders, and Top Politicos. Things are getting pretty ugly in GOP-land. Good stuff from Ross Douthat. For Rush, there are only two kinds of people in Republican Party: True conservatives like him, and “moderate Republicans.” The latter is an ideologically-inclusive category: You can be pro-choice or pro-life, David Frum or Colin Powell, a Rockefeller Republican or a Sam’s Club conservative; indeed, the only real requirement for moderate-Republican status is the belief that the Republican Party needs to reach out to voters who don’t agree with, well, Rush Limbaugh on every jot and tittle of what conservatism is and ought to be. This release hit the inbox today. Sounds fun. WASHINGTON, Oct. 27 /PRNewswire/ — SmartPower launched a new online video ad contest today to promote its national marketing campaign on energy efficiency. The SmartPower Energy Smart Online Ad Challenge uses new media and online social networking to promote conservation and energy efficiency. Anyone can participate by submitting a 30 second public service announcement to SmartPower through www.smartpower.org/adchallenge.php and www.youtube.com/group/energysmart. The goal of the contest is for the general public to create videos that show how energy efficiency helps Americans save money. SmartPower provides helpful facts on how to conserve energy on its website. These Energy Smart tips are simple and inexpensive ways people can conserve energy and reduce utility and fuel costs. Contestants are required to reference the SmartPower website and logo as well as the Energy Smart tips in their submissions. Though open to everyone, SmartPower’s Energy Smart Ad Challenge is designed to target young adults and teenagers. SmartPower’s award winning research has revealed that young people are the key when it comes to changing the culture of energy use and energy conservation. They have the power and the willingness to reduce consumption, influence their peers and parents and contribute to a safer and more sustainable future. The SmartPower Energy Smart Online Ad Challenge coincides with the organization’s recent decision to expand its mission beyond promoting and marketing clean, renewable energy to include energy efficiency. In addition to helping consumers choose clean energy sources, SmartPower wants to educate Americans about ways they can conserve energy in their day-to-day lives. SmartPower has designed a new user friendly website and has adopted ‘Let’s Get Energy Smart’ as its new tagline. SmartPower is accepting submissions for the Energy Smart Ad Challenge through Earth Day, April 22, 2009. For detailed information on the contest, including rules, criteria for judging and submission procedures, please visit www.smartpower.org/adchallenge.php. First, the $700 billion rescue for the U.S. economy was about buying devalued mortgage-backed securities from tottering banks to unclog frozen credit markets. But reports surfaced that bankers might instead use the money to buy other banks, pay dividends, give employees a raise and executives a bonus, or just sit on it. Insurance companies now want a piece; maybe automakers, too, even though Congress has approved $25 billion in low-interest loans for them. Three weeks after becoming law, and with the first dollar of the $700 billion yet to go out, officials are just beginning to talk about helping a few strapped homeowners avoid losing their homes in foreclosures. Is Virginia the key ..
… to an Obama victory next Tuesday? 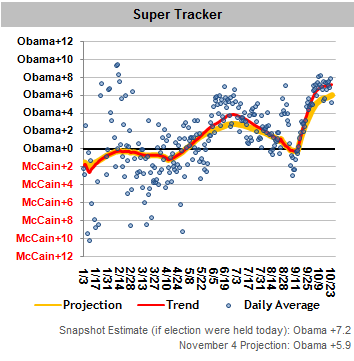 • SurveyUSA: Obama 52%, McCain 43%, outside of the ±3.9% margin of error, not significantly different from a 53%-43% Obama lead from three weeks ago. Nine percent of respondents have already voted, giving Obama a 67%-30% majority, and he’s ahead 50%-44% among the remaining 91% of likely voters. • Zogby: Obama 52%, McCain 45%, with a ±4.1% margin of error. There is no other recent Zogby phone poll for comparison. 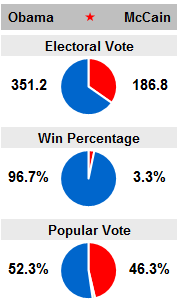 • Washington Post: Obama 52%, McCain 44%, with a ±3.5% margin of error, compared to a 49%-46% Obama lead a month ago. The early-vote number from SurveyUSA shows just what a hole John McCain is in. If he loses the early vote in a given state, he has to not only win the vote on Election Day, but win it by a large enough majority to overcome his early-vote deficit. Wish state might the McCain campaign really, really wish that they hadn’t insulted? I’ll give you a hint. It’s not technically a state, but rather, a commonwealth. Five separate polls of Virginia have been released within the past 48 hours. Zogby has Obama ahead by 7 points there, the Washington Post by 8, SurveyUSA by 9, Public Policy Polling also by 9, and Virgnia Commonwealth University by 11. Virginia, with 13 electoral votes, is a bit more electorally potent than Colorado; Obama could afford to lose either New Hampshire or New Mexico if he won there (though not both), which is not true about the Rocky Mountain state. 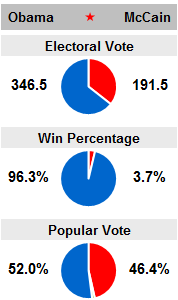 We are currently projecting Obama to win every John Kerry state, except New Hampshire, but plus Iowa, by double digits. If Obama wins all of those states plus Virginia, he’s at 268 electoral votes, meaning that any more electoral votes anywhere in the country would win him the election. This is a very cool press release. Be sure to hit the link at the bottom of the release for photos and links to AVI video from the seven cameras of Western’s Southern Ontario Meteor Network (SOMN). For the second time this year, The University of Western Ontario Meteor Group has captured incredibly rare video footage of a meteor falling to Earth. The team of astronomers suspects the fireball dropped meteorites in a region north of Guelph, Ontario, Canada, that may total as much as a few hundred grams in mass. The Physics and Astronomy Department at Western has a network of all-sky cameras in southern Ontario that scan the sky monitoring for meteors. On Wednesday, October 15 at 5:28 a.m., all seven cameras of Western’s Southern Ontario Meteor Network recorded a bright, slow fireball in the predawn sky. Associate Professor Peter Brown and Phil McCausland, a postdoctoral researcher in Planetary Science, are hoping to enlist the help of local residents in recovering one or more possible meteorites that may have crashed. By knowing the trajectory from the camera observations, the researchers can also track backwards to get the orbit of the object before it hit the Earth. “The meteorite was on a typical Earth-crossing asteroid-type orbit, so we also expect that it is a stony-type meteorite,” says McCausland. In March, the network of all-sky cameras captured video of a meteor falling to Earth that may have crashed in the Parry Sound area. That Pitt McCain volunteer mugging victim? Verrilli also told TPM that the McCain spokesperson had claimed that the “B” stood for Barack. McCain also called the hoax-merchant. Is this the kind of judgment you want in a president? Here’s another report on the sick, false hate-crime hoax. Wow. By now you’ve all heard about Ashley Todd, the 20-year-old McCain volunteer who claimed that she was assaulted in Pittsburgh on Wednesday night by an attacker who scratched a “B” in her cheek after learning that she was for McCain. The story was flacked madly last night by Drudge, even though few if any details had been established or independently confirmed. Late Update: KDKA’s full story has now been posted. It’s based on anonymous sources. So it’s still unclear what the story is. Stay tuned. Worth keeping an eye on Fox’s coverage of the latest turn in the story. Late Late Late Update: Police are set to hold a press conference to discuss the news, reports the Pittsburgh Post-Gazette. Latest Update: There are now conflicting reports on whether Todd confessed or police simply concluded the mugging story was a hoax. Ashley Todd, 20-year-old college student from College Station, Texas, admitted Friday that the story was false and was being charged with making a false report to police, said Maurita Bryant, the assistant chief of the police department’s investigations division. Police doubted her story from the start, Bryant said.Todd, who is white, told police she was attacked by a 6-foot-4 black man Wednesday night. Update 10/25 — Here’s the latest from TPM Election Central, including a little brushback against Team McCain’s assertion their spokesman in Pennsylvania is not a race baiter. Pretty thin gruel if you ask me. A spokesperson for McCain’s national campaign is pushing back on our story yesterday reporting that McCain’s Pennsylvania communications director was giving reporters an incendiary version of the attack hoax story before the facts were in. And tonight, COUNTDOWN asked the reporter from the other station, WPXI to check his notes. He says he got those quotes first, 4:08 p.m. yesterday from McCain`s Pennsylvania communications director.